Christmas week is finally here! All the gifts are bought (even if my dad's is the wrong one) and wrapped. Work gifts are all distributed, with instruction labels. Friend gift exchange is done - I got SO many ornaments! Now we're having fun relaxing and waiting on 3 family Christmas celebrations. The cats are even getting over the trauma of riding in the car for 4 hours. I love Christmas and the associated fun!!! 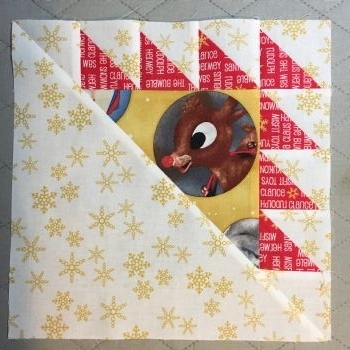 Monday's block - Rocky Glen - was fun because I got to use some of the leftover Rudolph the Red Nosed Reindeer fabric. 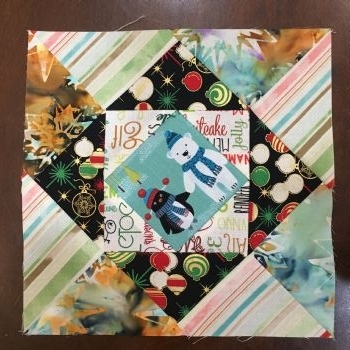 I also modified this block to make into pot holders for a buddy...she hasn't gotten her Christmas gift yet, but it is all made. 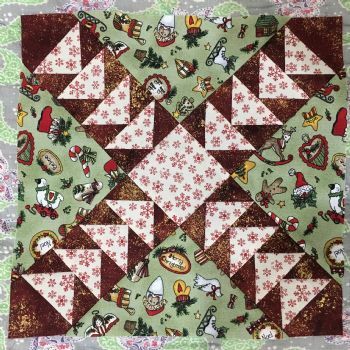 Tuesday's block - Scotch Squares - is pretty, but I think the pattern is written wrong. The center part is too big, so my corner pieces are stretched. I need to figure it out, because a friend wants the pattern. Yesterday's block (number 356) - Wild Goose Chase II - would have been much easier if I had brought the correct cutting tools with me. Also, the reds don't really work together, so the block is a bit unsatisfying. Today's block - Economy - was fun to make, and I really like it. 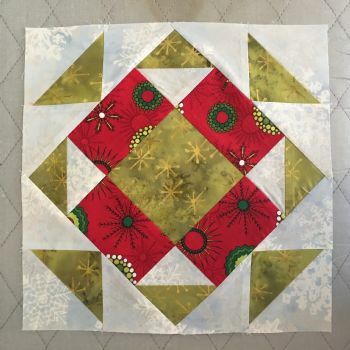 The center square is especially cute...of course, I had to fussy cut that from the very cute fabric piece. Only 9 blocks left...not sure what I'm going to do about that. That reindeer block and the polar bear and penguin are adorable!